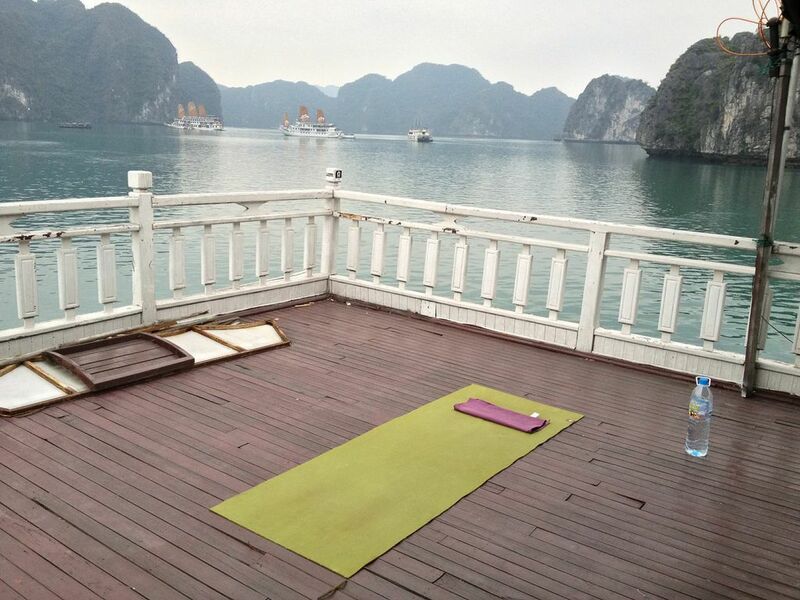 Keeping up with a yoga practice while traveling (can be hard). After traveling for about 2 months in Southeast Asia I want to share my experiences on maintaining a consistent practice amidst constant movement, potential lack of space and time, chaotic cities/buses/trains, and at other times ideal circumstances. 1. For me, I found that it was good to have a goal of something specific to do everyday. When I say goal, I do not mean practicing crazy yoga postures or experimenting with trying out a “new pose.” I was looking to establish consistency in doing something everyday that would be beneficial and supportive for how I was spending my time while both exploring and staying put. An example: if I had the ample time and space (which was most of the time) I aimed to do Urdhva Dhanurasana (upward facing bow/wheel pose) every day. For some people this may be easy to get into without much effort-No big deal. But like a lot of the yoga practice, none of it has ever come very easy to me. Working up to this pose gave me something to strive towards and build on day to day. I thought this would be a good goal for me to keep a healthy and strong spine…so I could continue to carry my backpack with belongings in it from place to place. Because of my vata (“spacey-ness”) that can be inflated through a lot of movement, traffic, sounds, excitement of what to eat for breakfast in a new city, etc…(the very qualities of travel), I would sometimes forget to do a prep pose that would be helpful prior to doing Urdhva Dhanurasana from time to time. Later I would remember that I did the prep pose the previous day in my practice. And that is why having a daily practice is compounding. It is building on your past experiences and carving out a new pathway. Maybe that is just my way of excusing my air-headed-ness, but I think it makes sense. Read more about consistency defined by Patanjali in the yoga sutras here. Halfway through the trip, broken toe pose (kneeling with the toes curled under) became another addition to the regimen. A simple pose like this which can be quite difficult for many westerners is very common among people in the east. I often saw people in temples or pagodas in this posture. Midway through the trip, I was at a Buddhist ceremony for a girl who passed away while in Cambodia, complete with monks, nuns, locals, and the officiator who, during long chanting of orations was kneeling like this for quite some time, and he was in his elder years too. My mobility was in need of a challenge here. If you’re taking my class lately you may have noticed we’ve been doing it daily. I’m not a holistic health expert, but from what I understand there are a lot of links to the feet and general well-being. From structural in the legs hips and torso to the functioning of the organs on a deeper level. So keep those feet healthy and free. 2. Don’t be too goal oriented. This is true for the yoga practice in general…but it’s good to have a reminder; you want to do a practice that physically supports and opens/strengthens your body. You will be moving from place to place seeing and experiencing a lot of “new.” For this reason I did a lot of the same poses and warm-ups with variations from time to time so that I could have something of a home to come back to daily. I’m a pretty boring guy and if you watched me practice you might fall asleep. “Why is he moving so slow? Didn’t he do that yesterday? Still in Triangle?? ?” I guess that would describe what I do. Nothing fancy, but hopefully well intended. Jim Bennitt gave me advice before I left to do a practice that keeps you healthy. It was great advice. It’s not a time to “go deeper” or explore the unexplored for you. If you injure yourself or get sick, you probably won’t have anyone to take care of you. 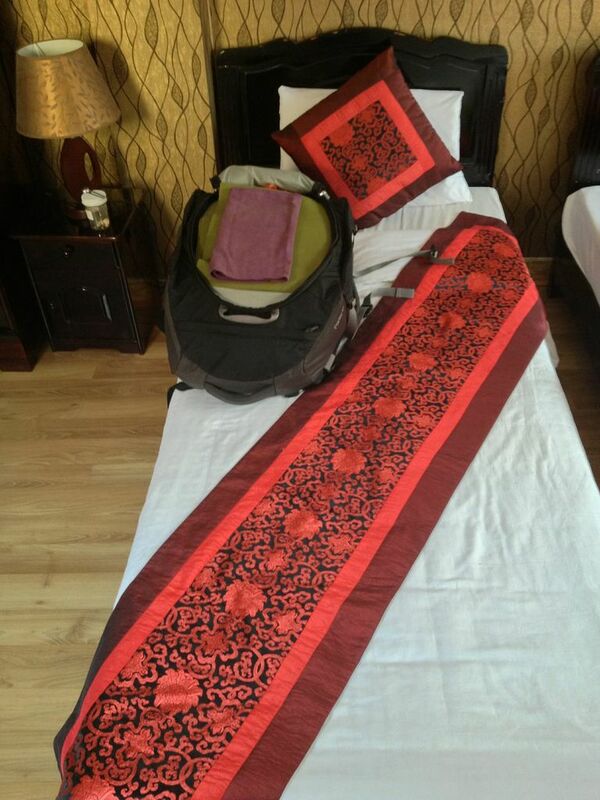 And you will need to carry your bag with all your belongings from bus to train to hotel to motorbike etc. Not to mention all the new food you will be ingesting. Keeping a general healthy digestion or agni (fire in the belly) is crucial to enjoying your time away from home. Having your digestive system in full normal operation is something that you will appreciate when in roam. How to do this? Forward foldings (compression in belly), twistings, inversions, uddiyana bandha (suspension of breath after exhale – which draws the internal organs towards the back body), and back bending (expansion of belly)…oh and drinking filtered or bottled water too! Considering that my daily practice was almost the same I would do some variations day-to-day if I “had more time” or felt the need to address something specific or a direction of movement in the body that I had been ignoring. In Kampot I engaged in several raging games of badminton with what seemed borderline professionals that made my shoulder crying for mercy that night and the following day. My reaction? Do a practice the next morning that addressed and gave extra attention to opening my shoulder/upper back and neck. Badda-bing! I felt much better for the rest of the day. That’s what so magical about acquiring knowledge of the body/mind/breath connection and the ability to use that knowledge to directly affect ourselves and students in a positive way. I found that I had a difficult time sustaining a specific pranayama practice as the weeks went on, other than long deep ujjayi during asana portion. I think that with any pranayama you need to have a lot of stability in all aspects to be grounded enough to work with this powerful layer (kosha). Being that the breath is so deeply connected to our nervous system it is important to not overtax your system with any major breath variations and/or retention. Upon return I’ve been easing back into more pranayama practices. 3. Time of day to practice? For me in the past year or so, I’ve found that morning time is the best. It’s a way to wake up the body and mind intelligently, versus just blindly starting the day without any real focus or intention. It’s very obvious to me when I don’t practice in the morning. I feel sluggish, a bit cloudy mentally, and not authentic, especially if I’m teaching a class that day. You hear a lot of yoga practitioners and teachers talk about their intention or sankalpa. Cultivating a directed focus in the morning which is already so conducive to stillness as well as new-ness makes sense, why not. I would feel this way at times when there was no option to practice, like taking overnight sleeper buses in Vietnam where you would wake up in a new city trying to find your way to a bathroom, breakfast, and a place to stay (in that order) while being hounded by motorbike and taxi drivers to make a buck. Other than that, the other reason I felt inclined to practice in the morning was to feel like I had a good reason to earn breakfast (and work through the previous day of ingesting). The BIG REWARD! I did it…ok now you have permission from your mind to fill your belly with delicious local cuisine. There were a few times that I would practice in the afternoon, but I can count them on one hand. They helped for sure, but keeping the same time every day was preferable. In packing/repacking my bag along the way I would always put my yoga mat on the top, so once I arrived to a new place I would open my bag, see my yoga mat, pull it out and have it visible in my room. The visual reminder was comforting and as well it didn’t let me escape that I’m in a relationship with my daily practice. Like you can feel someone is watching you from the corner of your eye. I didn’t always have a lot of space. At times I’d have to move furniture where I was staying, practice outdoors, be subconscious and at the same time get over those thoughts if people were watching me. All things that let me work on the more inner yoga practice versus the external form. I appreciate having some tools to take with me around the world that help me feel less crazy and more focused. Thanks for sticking around till the end of this passage and good luck on keeping up your practice wherever you are!